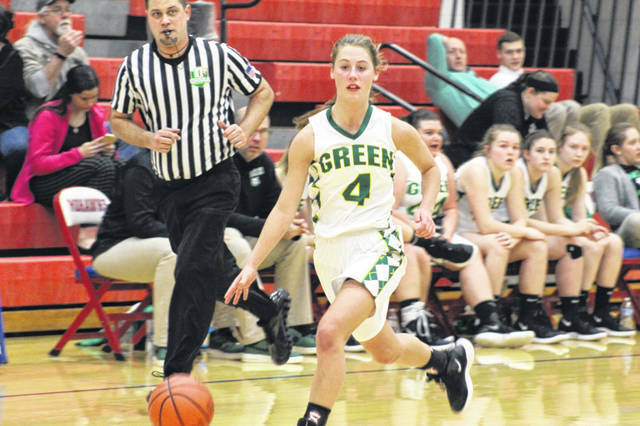 Green freshman Kasey Kimbler scored a game high 22 points in the Bobcats win over East Wednesday night. MCDERMOTT – The Green Bobcats came into Wednesday night’s sectional semifinal contest with SOC I and county rival East with the chance to accomplish two goals they set at the beginning of the season. After their 59-30 win over the Tartans, Melissa Knapp’s bunch of Bobcats checked off both those boxes in route to sectional final date with second seeded Peebles Saturday afternoon with a chance to go to the district semifinals on the line. Wednesday night’s victory is the Bobcats first postseason victory since the 2008-2009 season. That postseason included a sectional final win over Ironton St. Joe 54-29, and a district semifinal loss to Valley 63-45, in what was also the school’s last sectional title. The Bobcats first postseason win in ten years will not only pay dividends for this season, Knapp says, but also as her young team continues to grow over the course of their high school careers. Green started off on a roll in their matchup with the Tartans and continued to roll from there. After the first quarter, Green held an 18-6 lead, thanks in large parts to the Bobcats best scoring option throughout the season, freshman Kasey Kimbler. Kimbler led the Bobcats in scoring with a game high 22 by game’s end and broke a record to go along with her game high effort. Along with making five three’s in Wednesday’s sectional game, Kimbler broke the school record for most three’s in a season. Seven different Bobcats found the scoring column Wednesday night, six of which finished with at least five points. East was led in scoring by sophomore Grace Smith who finished with a team high 19 points a player that Knapp was quick to praise following their conclusion of Wednesday’s game. On Saturday afternoon, the Bobcats will face another tough test in order to earn their first sectional title in ten years in a contest with second seeded Peebles of the SHAC. https://www.portsmouth-dailytimes.com/wp-content/uploads/sites/28/2019/02/web1_IMG_9861-2.jpgGreen freshman Kasey Kimbler scored a game high 22 points in the Bobcats win over East Wednesday night.